From its majestic, verdant mountain peaks to its serene, sandy coves, Saint Lucia seems naturally inclined to inspire romance. So it’s no wonder that the producers of the TV show “The Bachelor” chose the island as the setting for its final episode. What better place to declare your love than on its singularly pristine shores, fronted by a brilliant blue horizon? But worry not, true romantics: the inspiring ambiance of Saint Lucia is far more enduring than reality show fame. With a landscape unmatched in beauty, accommodations built for passion and attractions ranging from the adventurous to the tranquil, there’s a legendary romantic getaway here for every couple, from honeymooners to lifelong loves—and enough to keep them returning for years to come. Saint Lucia owes much of its romantic appeal to its terrain: exotic, striking and uniquely picturesque. Even travelers familiar with the Caribbean are awed by the scenery of its Piton Mountains, rising to a height of 2,500 ft. and plummeting directly down into the Caribbean Sea. Couples can take in these spectacular attractions from a variety of venues in and around the Creole town of Soufriere, itself a romantic blend of French and Caribbean cultures. After they’ve explored Soufriere’s historic estates, many adventurous travelers take on the island’s many hiking trails in search of even more romantic views. The climb to the top of the Pitons is strenuous, but well worth it for clients with a passion for hiking, panoramic island views and, of course, each other. Other, less difficult hiking trails let clients explore Saint Lucia’s rainforest, filled with lush vegetation, exotic animal life, and plenty of privacy. The Edmund Forest Reserve, set about 30 minutes from Soufriere, offers spectacular views of the Caribbean Sea and Mount Gimie, the island’s highest peak. The Enbas Saut Waterfalls Trail, meanwhile, comes with a sensual bonus: two tall waterfalls cascading into natural swimming pools, giving couples the chance to cool off in a secluded, exotic setting. The island’s coastline is equal to its inland landscape in both diversity and uniqueness. Saint Lucia’s beaches rank among the best in the world, with Jalousie Beach’s location between the Pitons making it a favorite for honeymooners. Anse Chastanet’s curved cove is lined with palm trees, and features a coral reef that makes it ideal for both sunning and snorkeling. And at the north end of the island, Pigeon Island National Park’s beach is often uncrowded, but no less scenic. All beaches in Saint Lucia are public, so couples are free to explore and find their own private place in the sun. One popular honeymoon upgrade is a tour of the beaches on horseback, adding a unique and romantic component to the traditional beach experience. Tours on horseback often include inland trails and traditional Caribbean lunch as well, giving couples the chance to have an authentic island experience together. With romance literally surrounding them, it’s no wonder that Saint Lucia’s resorts tend to emphasize the romantic aspects of their accommodations and amenities. The island is home to some of the best honeymoon resorts in the world, including Jade Mountain, the exclusive, all-suite getaway set high in the mountains, and which happens to be the very place where “The Bachelor” himself proposed. Every suite here is an ideal honeymoon suite, featuring views of the majestic Pitons from decks that include private plunge pools. Rumor has it that a honeymoon couple once spent five days in the suite before coming back out. Ladera offers similar suites with more rustic decor, but similar views and open-air construction. Sandals Regency La Toc Golf Resort & Spa’s new Millionaire Suites were also designed with couples in mind. Each stand-alone suite sits at the resort’s highest point, giving clients unobstructed 360-degree views of the picturesque island and sea below. Couples can soak up the sun on their private patio, or take a dip in their own plunge pool or whirlpool. And that’s just the beginning. Honeymooners at any of Sandals’ three properties can create a vacation registry through Sandals to enjoy private dinners for two, couples’ spa treatments and tours of the local area—all compliments of their wedding guests. Saint Lucia’s romance doesn’t end at the coast. A picturesque sail from its shores is an unmissable part of the island experience, particularly for honeymooners seeking idyllic sunset views. Just about every resort in Saint Lucia offers a sunset cruise; some even include champagne in the tour for an added romantic bonus. But though sunset is the island’s most popular time for couples to sail, it’s far from being the only option. Clients can also book a whale watching tour during the day for a chance to see any of the more than 20 species that regularly make an appearance off Saint Lucia’s coast, as well as several species of dolphins and sea turtles. Clients who are just going a short distance may want to consider taking a water taxi, a scenic alternative to ordinary taxis on land. Couples headed to Anse Chastanet or Jalousie Beach from Soufriere, for example, will find local water taxi operators at the jetty. Be sure to bargain for the best price! What’s a romantic getaway without a little decadence? 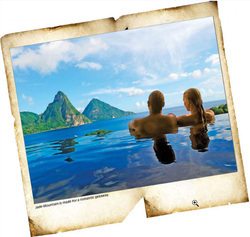 In Saint Lucia, couples find a vast variety of ways to pamper themselves and their partners. When it comes to spas, there’s no better destination in the Caribbean for state-of-the-art, unique and local treatments. Resorts like The BodyHoliday, LeSPORT offer a spa-centric experience with treatments built into its all-inclusive pricing; most other resorts offer some sort of treatment, ranging from in-room massages to more involved procedures within large, modern spa facilities. At The Landings, for example, couples can access a 7,000-sq.-ft. spa with “Shared Moments” rooms for couples, as well as wet therapy rooms and VIP rooms with private terraces and hydrotherapy tubs. For anyone who believes that the stomach is the quickest way to a man’s heart (or a woman’s heart, for that matter), Saint Lucia is a foodie paradise. Local cuisine here features fresh ingredients grown or caught locally, including plantains, breadfruit and, of course, seafood. Weekly parties like Anse La Raye’s Seafood Fridays give couples the chance to fill up on the sublime daily catch and mingle with the locals. 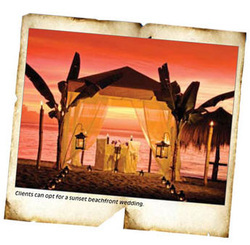 For a more intimate experience, couples need only make a reservation at one of Saint Lucia’s romantic restaurants. 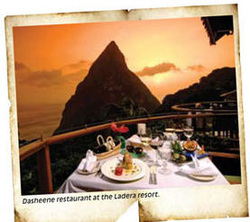 Dasheene, at Ladera resort near Soufriere, is set high up in the mountains with an open-air balcony that offers spectacular views of the Pitons, particularly at sunset. Jalousie Plantation’s Bayside restaurant offers a casual yet intimate dining experience right on the beach. But for a true indulgence, clients should book an exclusive, private dinner for just two. Several resorts in Saint Lucia, including the Sandals resorts, will set up private dinners on the beach, with service from a dedicated staff and lit only by torches and moonlight. Others, like Anse Chastanet, will set up more casual meals amid the ruins of centuries-old plantations that remain on their property. But perhaps Jade Mountain offers the most intimate dining experience in Saint Lucia: gourmet meals featuring locally farmed ingredients, all served in the comfort of couples’ private, spacious suites, to be enjoyed at the dining table, beside their private pool, or even in bed. Lush Saint Lucia has been blessed with a number of stunning locations that make for ideal backdrops for a wedding or vow renewal. There are those emerald UNESCO World Heritage Piton Mountains of course, or the incredible Touraille Waterfall, which is great for a small wedding party. No shoes? No problem—choose a barefoot experience by the shore. Another option is to marry at one of several gardens in Saint Lucia, including Diamond Botanical Gardens in Soufriere, home to the Diamond Mineral Baths built for French troops in 1784.
treetops and looking out to the Caribbean Sea. Some couples love their premium or hillside deluxe room so much they choose to marry right there, with the views of the ocean and Pitons around them. There’s also the ruins at Anse Mamin Historical Plantation, which provide an added air of island charm. Couples and their party arrive by boat. Guests staying at Jade Mountain can marry on its Celestial Terrace or infinity pool sanctuary, surrounded by the natural beauty of Saint Lucia. The resort can also arrange underwater ceremonies—clients say their vows on land, then dive right in to “repeat” them using signs and sign language. Another option is to hop on one of Anse Chastanet’s boats and hold a small ceremony there, then jump in the water if they choose. The resort’s vast experience in creating incredible memories means they’ve developed great relationships with vendors throughout the island and can help couples every step of the way—getting a saxophonist or band, putting together a variety of inspiring menus for the reception, whipping up cocktail parties and finding the prettiest tropical flowers for the bride’s bouquet. They even have a dedicated website, elopetoparadiseweddings.com. Cap Moule a Chique Lighthouse, on the southernmost tip of Saint Lucia, is the “newest” wedding ceremony venue. This is the second highest lighthouse in the world and is set to welcome more ceremonies through the all-inclusive Coconut Bay Resort & Spa’s commissionable Lighthouse Wedding packages. Coconut Bay attracts couples putting together multi-generational weddings, as it features Saint Lucia’s largest water park and other activities for the younger guests, while enticing adults with an oceanfront spa and varied entertainment and dining options. The Jalousie Plantation is also a fantastic option if clients want to take advantage of Saint Lucia’s pristine, mountain-ocean panoramas while enjoying the convenience of a resort wedding. Like Jade Mountain, this property was also featured on “The Bachelor: On the Wings of Love,” letting romantics around the world imagine their own wedding here. Flanked by the Pitons, the resort can prepare a memorable day with decorated arches on the beach or a ceremony right on its dock, the waters of Anse de Pitons sparkling below.